Naringin, chemically 4′,5,7- trihydroxyflavanone-7-rhamnoglucoside, is a major flavanone glycoside obtained from tomatoes, grapefruits, and many other citrus fruits. It has been experimentally documented to possess numerous biological properties such as antioxidant, anti-inflammatory, and antiapoptotic activities. In vitro and in vivo studies have further established the usefulness of naringin in various preclinical models of atherosclerosis, cardiovascular disorders, diabetes mellitus, neurodegenerative disorders, osteoporosis, and rheumatological disorders. Apart from this, naringin has also exerted chemopreventive and anticancer attributes in various models of oral, breast, colon, liver, lung, and ovarian cancer. This wide spectrum of biological expediency has been documented to be a result of either the upregulation of various cell survival proteins or the inhibition of inflammatory processes, or a combination of both. Due to the scarcity of human studies on naringin, this review focuses on the various established activities of naringin in in vitro and in vivo preclinical models, and its potential therapeutic applications using the available knowledge in the literature. Additionally, it also encompasses the pharmacokinetic properties of naringin and its inhibition of CYP isoenzymes, and the subsequent drug interactions. Moreover, further clinical research is evidently needed to provide significant insights into the mechanisms underlying the effects of naringin in humans. Naringin was first discovered by De Vry in the flowers of grapefruit trees growing in Java in 1857, but he did not publish his findings at that time . Extensive research on this “novel compound” was conducted in the years to come by De Vry and Hoffman, and, subsequently, Will . The name naringin is probably derived from the Sanskrit term “narangiʼ meaning “orange” . It is present in citrus and grape fruits, beans, cherries, cocoa, oregano, and tomatoes , , , , , . It is present in grapefruit juice up to concentrations of 800 mg/L . The chemical structure of naringin was first elucidated in 1928 by Asahina and Inubuse  and is depicted in [Fig. 1]. Naringin is a flavanone glycoside composed of naringenin, an aglycone and neohesperidose attached to the hydroxyl group at C-7 and tastes bitter due to its glucose moiety . Nevertheless, it can be converted to 1,3-diphenylpropan-1-one, a compound 300–1800 times sweeter than sugar with a menthol-like refreshing sweet taste when treated with potassium hydroxide or another strong base . Depending up on the maturity of the fruit and the method of purification, naringin naturally occurs as a mixture of chiral isomers that markedly vary in proportion . Fig. 1 Naringin and its metabolism in humans. Naringin typically exemplifies the term “phytopharmaceutical”, which commonly refers to products obtained from plants that are found to be useful in human disorders. Naringin being a very common dietary constituent would invariably be present in a lot of the dietary products consumed by humans. Thus, a human being would be exposed to naringin intake in some form or another. Literature is replete with various researches and reviews that focus on the numerous potential therapeutic effects of naringin. In fact, a wide spectrum of beneficial effects has been attributed to naringin including cardiovascular, hypolipidemic, antiatherosclerotic, antidiabetic, neuroprotective, hepatoprotective, and anticancer activities , . These articles highlight the fact that naringin possesses the potential to be employed as a therapeutic agent in a large number and variety of human ailments. At the same time, the occurrence of adverse reactions with allopathic medications might encourage physicians to explore safer alternatives in complementary medicine, thus prompting the development of naringin and related flavonoids for therapeutic purposes. Moreover, the knowledge of pharmacokinetic properties and potential interactions of naringin with other drugs would assume paramount importance, as it would provide guidance for the measures that should be taken and precautions to be followed during consumption of naringin, which would also simultaneously apply to patients taking other medications and concomitantly consuming dietary constituents rich in naringin. Unfortunately, information on these parameters of naringin are limited and scattered in the literature. Hence, this review aims at summarizing the experimental work performed to date on biological actions, mechanisms of action, pharmacokinetic data, and clinically relevant drug interactions of naringin. To the best of our knowledge, this attempt is the first of its kind. Database searches using Google Scholar, Pubmed, and Science Direct were conducted until 15th December 2013 to include up-to-date documented information in the present review article. The search was limited to English language papers. For data mining, the following MESH words were used in the databases mentioned above: naringin allergies, naringin Alzheimerʼs, naringin anti-inflammatory, naringin antioxidant, naringin anxiety, naringin apoptosis, naringin arthritis, naringin atherosclerosis, naringin bioavailability, naringin bone, naringin brain, naringin cancer, naringin cardioprotection, naringin cholesterol, naringin chromatography, naringin cough, naringin CYP, naringin dentistry, naringin dermatology, naringin diabetes, naringin drug interaction, naringin epilepsy, naringin gastrointestinal, naringin heart, naringin hepatoprotection, naringin hyperglycemia, naringin hyperlipidemia, naringin hypertension, naringin in vitro, naringin in vivo, naringin infection, naringin insulin, naringin kidney, naringin liver, naringin lungs, naringin malignancies, naringin metabolic syndrome, naringin nephroprotection, naringin neuroprotection, naringin obesity, naringin osteoporosis, naringin pain, naringin pharmacokinetics, naringin platelet, naringin prokinetic, naringin pulmonary system, naringin radiation, naringin radioprotection, naringin skin, naringin stroke, naringin toxicity, naringin transporter, naringin tumor, naringin ulcer, and naringin ulcerative colitis. In almost all cases, the original articles were obtained and the relevant data was extracted. Extensive studies to elucidate the pharmacokinetic properties of naringin have been performed on rats , , , , , rabbits , dogs , , and humans , , . Naringin, upon oral administration to rats, results in several metabolites like naringenin, naringenin glucuronide, and naringenin sulphate in the blood and urine , , , , . The hydrolysis of naringin to naringenin is catalyzed by enzymes such as α-rhamnosidases and β-glucosidases , . Additionally, naringin is also transformed by the intestinal microflora into many kinds of phenolic acids due to ring fission , , . 4-Hydroxybenzoic acid, 2,4,6-trihydroxybenzoic acid, phloroglucinol, 4-hydroxyphenylpropionic acid, and 4-hydroxyphenylacetic acid have been identified as the major metabolites of naringin . 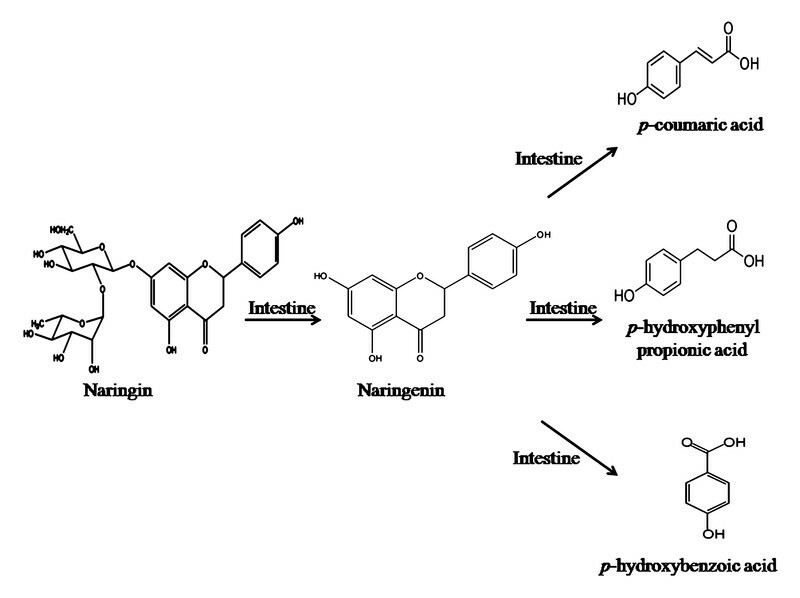 Besides, naringenin was incubated with rat liver microsomes and produced three metabolites (two naringenin hydroxylates and 5,7-dihydroxychromone) . Tsai and Tsai demonstrated that the portal and lymphatic absorptions for naringin were about 95 and 5 %, respectively . Naringin and naringenin are both detectable in plasma about five hours after oral administration , . Zou and colleagues have demonstrated that naringin and its metabolites, being highly lipophilic, are distributed to almost all the body organs with the highest concentrations being observed in the stomach and the lowest in the brain due to reduced blood brain barrier permeability. Naringin is concentrated in the liver and bile by the processes of active transport , . Naringin undergoes extensive phase I and phase II metabolism in the liver, as depicted in [Fig. 1]. Liu and colleagues have identified a total of 23 metabolites of naringin after oral administration to rats (42 mg/kg) and dogs (12.4 mg/kg). They identified 4-hydroxyphenylpropionic acid (37 % in dogs and 16 % in rats) as a major metabolite of naringin . Elimination of naringin occurs both by the kidneys into urine and by the liver into bile by partly undergoing bacterial ring cleavage (of the C-ring), and subsequently the three carbon bridges to the dihydrochalcone moiety. The excretion in urine varies from 5 to 57 % of the consumption according to an observation by Fuhr and Kummert . Sixty percent of an administered dose was recovered from the urine and feces of dogs and 21 % in rats in the form of metabolites within 36 h after administration by Liu and coworkers . However, at 48 h post-dose, 1 % of administered naringin was recovered from the urine of rats and 8 % in dogs as free naringin and naringenin, which was similar to that in humans (about 5 %) , , , . Ishii and coworkers studied the elimination of naringin in a single healthy volunteer who received 500 mg of naringin. They observed that the peak urinary level of naringin (~ 64 µg) was attained at around 4 h, naringenin (~ 850 µg) at around 24 h, and naringenin glucuronides (~ 4 mg) at around 10 h .
As traditional medicines become increasingly popular globally, the significant potential for interaction between traditional medicines and allopathic medicines tends to hog the limelight. Numerous studies have shown that naringin interferes with the activities of transporters and enzymatic proteins in the intestines and, hence, with the absorption and breakdown of certain drugs, resulting in altered blood levels of these drugs. Naringin is a potent inhibitor of transporter proteins such as OATP isoforms as well MDR and SULT. This leads to decreased absorption and, hence, bioavailability of drugs such as pitavastatin  via inhibition of OATP1A5 and MDR-1, imatinib via inhibition of OATP1A2 , and β 2 agonists via SULT1 and SULT3 . Naringin also inhibits the sulfation of various drugs such as paracetamol and minoxidil via P-form phenolsulfo-transferase inhibition and, thus, interferes with their metabolism, leading to increased plasma levels in these drugs . Contrarily, naringin enhances the absorption of colchicine through p-glycoprotein modulation . Naringin also inhibits various CYP isoenzymes, thus increasing the bioavailability of calcium channel blockers such as verapamil  via CYP3A4 and paclitaxel via CYP3A1/2 inhibition . Nevertheless, naringin has also been shown to have no effect on the pharmacokinetics of drugs such as doxorubicin  and caffeine . In another investigation, naringin has been shown to mediate the chemosensitizing effect via reducing anticancer drug-induced p-glycoprotein expression, a membrane-associated drug efflux pump whose increased expression results in the resistance to anticancer drugs such as doxorubicin . Moreover, naringin also inhibits the activation of carcinogens by CYP isoenzymes, thus suggesting a role in the prevention of carcinogenesis . In vitro: In the earliest of reports, naringin was shown to possess strong superoxide scavenging activity (IC50 of 192.0 ± 6.7 µM)  and xanthine oxidase inhibitory activity (200–400 µM) . Studies conducted on erythrocytes exposed to phenazine methosulfate and diethyldithiocarbamate have provided strong evidence regarding the ability of naringin (0–500 µM) to quench ROS, decrease the oxygen-free radical-stimulated K+ permeability, and inhibit lipid peroxidation . This ability to scavenge free radicals has also contributed to the inhibition of the nitrite-induced oxidation of hemoglobin to methemoglobin in erythrocytes by naringin (0.02–2.0 mM)  and the reduction of glucose-6-phosphate dehydrogenase inactivation by low-frequency ultrasound cavitation (0.01–50 µM) . Naringin (1–100 µM) was also shown to reverse the ROS-mediated apoptosis via caspase-3 activation in human polymorphonuclear neutrophils . Jagetia and coworkers have demonstrated that naringin (0.5–5 mmol/L) significantly suppressed iron-induced lipid peroxidation, protein oxidation, and DNA damage . As an extension of this work, the same group also revealed that naringin (50 nM) could inhibit iron-induced oxidative stress in iron overloaded isolated mouse liver mitochondria . The antioxidant potential of naringin could prove to be of therapeutic importance in diabetes mellitus and neurodegenerative disorders. Naringin (30 µM) has reduced high glucose-induced upregulation of ICAM-1 via its antioxidant effect, thus suggesting a potential ameliorating effect on the macrovascular complications of diabetes mellitus . Naringin (80 µmol/L) has also been shown to inhibit the ROS-activated MAPK pathway in high glucose-induced injury in H9c2 cardiac cells . In PC12 neuronal cells, naringin (3.125–25 µM) can significantly inhibit H2O2-induced cytotoxicity via attenuating caspase-3 and MMP-9 expression, and bolstering the antioxidant defense system, thus ameliorating neurodegeneration . Naringin (80 mg/kg) can also significantly reduce 3-nitropropionic acid-induced neurodegeneration in rats via oxidative stress inhibition and Nrf2 activation  as well as inhibition of apoptotic markers (Bax and Bad) . Naringin (1 mM and 200 mM, respectively) has been shown to inhibit H2O2 and cytosine arabinoside-induced cytotoxicity and apoptosis in mouse leukemia P388 cells via augmenting the antioxidant enzyme activities , . Naringin has shown significant protection against DNA damage induced by UV-A radiation in mouse embryo fibroblast C3H10T1/2 cells at doses of 10 and 23 µM  and gamma-irradiated human white blood cells at a dose of 50 µM, which might be due to its ability to quench O2 . Naringin (1–2 µg/ml and 1 mM, respectively) significantly attenuated the cadmium and bleomycin-induced genomic damage in human lymphocytes  and V79 cells . Similarly, it also reduced the benz[a]pyrene phototoxicity (an air pollutant responsible for mutagenicity and carcinogenicity) in Balb/c 3T3 cells at doses ranging from 0.1–1.0 mM . In a comparative study, naringenin was found to be more potent than naringin in scavenging superoxide (with 4-nitroblue tetrazolium chloride, IC50 of 94.7 ± 0.9 vs. 169 ± 2.9 and with xanthine oxidase, IC50 of 4.4 ± 0.2 vs. 230 ± 4.6) and hydroxyl radicals (with EDTA, IC50 of 1.06 ± 0.004 vs. 1.36 ± 0.03 and without EDTA, 1.55 ± 0.1 vs. 2.66 ± 0.07). Moreover, in the same study, an ABTS assay showed that naringenin (7.9 ± 0.2 µmol/L) exhibited a higher capacity to inhibit 50 % of ABTS radical cation generation than naringin (27.1 ± 0.4 µmol/L) and, at the same dose (0.1–0.5 mg/mL), has significantly higher antioxidant efficiency as exemplified by the FRAP assay . Additionally, naringin-Cu (II) complex 1 also exhibited higher antioxidant, anti-inflammatory, and tumor cell cytotoxic effects as compared with naringin alone . In vivo: Naringin (3 % fed to flies in culture medium) has been shown to inhibit the protein hDuox2, a member of the NADPH oxidase family, in a GMR-GAL4/UAS-hDuox2 fly line screening model, thereby implicating a strong antioxidant potential through inhibition of ROS . The same antioxidant potential of dietary naringin (1.5–3.0 g/kg) was responsible for decreased serum triacylglycerol levels in fish oil supplemented fattening lambs . In fact, in a comparative study, dietary naringin (0.5 g/kg) exerted an antioxidant effect comparable to that of probucol (0.5 g/kg) and lovastatin (0.3 g/kg) administered for the same duration , . Naringin administered at a dose of 400 mg/kg has been reported to ameliorate renal ischemia-reperfusion injury through free radical scavenging and antioxidant properties . Naringin (5 and 10 mg/kg) has also shown protective effects in testicular ischemia-reperfusion-induced oxidative stress in rats . In rats, naringin at a dose of 20–80 mg/kg has been shown to exert a protective effect against nickel sulphate-induced nephrotoxicity and hepatotoxicity via attenuating the injury markers and lipid peroxidation, as well as increasing the antioxidant status , . Likewise, naringin at a dose of 100–400 mg/kg has also been shown to ameliorate ferric-nitrilotriacetate and glycerol-induced nephrotoxicity in rats via normalizing plasma creatinine, blood urea nitrogen, urea clearance, and bolstering renal antioxidant levels , . Naringin (50–500 mg/kg) also prevented the cardiomyocyte and hepatocyte DNA damage produced by daunorubicin in mice, probably due to its strong capacity to trap free radicals . It (5–50 mg/kg) has also been shown to have a protective role in the abatement of lomefloxacin-induced genomic instability in mice, most likely due to its antioxidant effects . Naringin (50 mg/kg) has been shown to protect against hyperglycemia-mediated oxidative stress and proinflammatory cytokine production in high-fat fed/streptozotocin-induced type 2 diabetic rats . Moreover, owing to its antioxidant potential, naringin (25–50 mg/kg) substantially prevented diabetes-induced chromosomal instability in rats . Naringin (2 mg/kg) shielded mouse bone marrow, intestines, and the liver against radiation-induced damage by reducing the lipid peroxidation and elevating the antioxidant status , . Similarly, naringin at a dose of 100 mg/kg protected the mice from the lethal effects of whole-body irradiation . Cumulatively, these studies have established the usefulness of naringin in ROS-associated diseases. In vitro: Naringin (1 mM) suppressed LPS-induced synthesis of NO, iNOS, COX-2, TNF-α, IL-6 production, and NF-κB activation in RAW 264.7 macrophages . In the same model, naringin (50–200 µM) has been shown to mediate its anti-inflammatory effect by inhibiting IL-8, MCP-1, and MIP-1α secretion and mRNA expression, and by inhibiting the phosphorylation of ERK1/2, JNK, and p38 MAPK, probably through blocking the activation of the NF-κB and MAPK signaling pathways . It (0.25 and 0.5 mmol/L) also significantly inhibited the TNF-α/IFN-γ-induced RANTES expression in human HaCaT cells via the NF-κB-dependent signaling pathway . It significantly attenuated enzymatic activity of sPLA2 and its associated pharmacological effects such as myonecrosis, platelet aggregation, and cytotoxicity . It (10–50 µg/ml) also interfered with monocyte adhesion and subsequently reduced high-glucose-induced vascular inflammation in HUVECs . In a study by Lee and Kim, naringin was shown to inhibit both COX-1 and COX-2 (IC50 > 100 and 60.02, respectively) and also LPS-stimulated nitric oxide production (IC50 > 100), thereby implicating its usefulness in rheumatoid arthritis and other inflammatory diseases . In addition, a naringin-leucine (N-Leu) combination (15–150 µM) reduced the hyperinflammatory status in cystic fibrosis cell lines via inhibiting the expression levels of IKKα, IKKβ, NF-κB, and phosphorylation of ERK1/2 kinase . In vivo: Modern scientific researches, as described further, have demonstrated that naringin exerts an anti-inflammatory effect in numerous chronic inflammatory diseases. Naringin (10–60 mg/kg and 0.3–3 mg/mouse, respectively) has shown protection against LPS-induced endotoxic shock in male ddY mice via inhibition of TNF-α release  and blocked the lethal shock in D-galactosamine-sensitized C57BL/10ScSn mice . It (15–60 mg/kg) also significantly ameliorated LPS-induced acute lung injury in mice via suppression of myeloperoxidase, iNOS activity, TNF-α secretion, and NF-κB activation . In rats exposed to endotoxin, naringin (0.4–40 µg/kg) prevented the occurrence of uveitis via inhibition of PGE2 and NO . Pretreatment with naringin (20–80 mg/kg) substantially reduced chronic pulmonary neutrophilic inflammation in cigarette smoke-exposed rats . In a guinea pig model of chronic bronchitis induced by cigarette smoke, naringin (9.2–36.8 mg/kg) attenuated airway hyperresponsiveness and airway inflammation along with a decrease in coughing . Moreover, in the same model, naringin (18.4 mg/kg) was shown to be effective in inhibiting both airway neurogenic inflammation and coughs through a mechanism involving a significant reduction in substance P content and NK-1 receptor expression . Naringin (30 mg/kg) has also shown significantly potent anti-inflammatory potential in the rat air pouch model of inflammation . In a DSS-induced ulcerative colitis mouse model, naringin (15.8 mg/kg) inhibited the production of nitrates and nitrites (indicators of the inflammatory process), and reduced intestinal edema, suggesting its potential therapeutic role in the treatment of inflammatory bowel disease . A collaborative research from our laboratory has shown that naringin (20, 40, and 80 mg/kg) significantly protects against the kainic acid-induced status epilepticus and cognitive impairment in rats via anti-inflammatory and antioxidant pathways . Collectively, these preclinical studies have identified a diverse range of biological targets and intricate mechanisms of action that characterize naringin as an extremely potent anti-inflammatory molecule. Table 1 Various disorders in which naringin has been documented to be effective. Table 2 The expressions and activities of proteins modulated by naringin. In vitro: Studies have shown that naringin prevents in vitro LDL oxidation and therefore could potentially retard the progression of atherosclerosis . Another mechanism of naringin (25 µM) that has been elucidated is the inhibition of the transfer of an acetyl group from PAF to lysophospholipids that prevents the activation of endothelial cells and, hence, retards the process incriminated in the development of an atherosclerotic plaque . An initiating step in the pathophysiology of atherosclerosis is the proliferation of vascular smooth muscle cells that is inhibited by naringin by multiple mechanisms, namely, induction of p21WAF1-mediated G1-phase cell cycle arrest in vascular smooth muscle cells via activation of the Ras/Raf/ERK signaling pathway at a concentration of 0–150 µM  and repression of the PI3K/AkT/mTOR/p70S6K pathway and MMP-9 expression through the transcription factors NF-κB and AP-1 in TNF-α-induced vascular smooth muscle cells at a concentration of 10–25 µM . In vivo: The hypocholesterolemic potential of naringin suggests a utility in therapy of atherosclerosis, which has been further substantiated by various studies, as described below. Naringin has been shown to inhibit hepatic HMG-CoA reductase (a rate limiting enzyme of the cholesterol biosynthetic pathway) and acyl CoA : cholesterol acyltransferase (a cholesterol esterifying enzyme) when administered to high-cholesterol fed rats at a dose of 1 g/kg . The inhibition of HMG-CoA reductase was also demonstrated by Lee and coworkers in high-cholesterol fed rabbits, administered dietary naringin 1 g/kg, along with that of other proteins involved in the adhesion of leukocytes to the endothelium such as VCAM-1 and MCP-1 . Naringin (0.5 g/kg) has also been shown to decrease the expression of ICAM-1 in endothelial cells, fatty streak formation, and neointimal macrophage infiltration in hypercholesterolemic rabbits , and also lower plasma cholesterol levels . Similar results were also reported by Kim and coworkers in cholesterol fed LDL-receptor knockout mice when dietary naringin was administered at a dose of 0.2 g/kg . Naringin (0.2 g/kg) reduced the hepatic synthesis of cholesterol and, subsequently, the plasma lipid levels in Sprague-Dawley rats after 6 weeks of administration . Naringin (0.2 g/kg) also prevents the adhesion of immune cells, their infiltration in the intima of the vascular wall, and, subsequently, smooth muscle cell proliferation as observed in diet-induced hypercholesterolemic mice . Beneficial effects were also observed in humans by Jung and coworkers, in whom dietary naringin (0.4 g/kg) reduced plasma LDL-cholesterol levels along with apolipoprotein B levels . Nevertheless, contrasting results have also been obtained as naringin (0.5 g/kg) did not show any affect on serum total cholesterol and LDL-C concentrations in moderately hypercholesterolemic men and women . In vitro: Naringin (0.1–0.3 mM) promoted relaxation of the isolated rat thoracic aortae in response to phenylephrine (a vasoconstrictor), the mechanism for which it was postulated to be an inhibition of Ca2+ influx and for the release of calcium from intracellular stores, suggesting a vasorelaxant effect . This effect was further supported by Saponara and associates in endothelium-denuded rat aortic rings administered naringin at a concentration of 1–100 µM . Furthermore, the K+ influx can also be activated by naringin (100 µM) through a direct activation of the inward rectifying potassium channels . Naringin (5 µM) has also been shown to inhibit high-glucose-induced apoptosis in H9c2 cardiomyocyte cells through attenuation of mitochondrial dysfunction and modulation of the p38 signaling pathway . In vivo: Naringin (0.25–1.0 g/kg) augmented nitric oxide bioavailability, which contributed substantially to the amelioration of hypertension and cerebral thrombosis in stroke-prone, spontaneously hypertensive rats . The cardioprotective effects of naringin can be explained at the molecular level, whereby naringin (10–40 mg/kg) has exerted protective effects against isoproterenol-induced myocardial damage by significantly increasing the activity of Na+-K+-ATPase, while reducing those of Ca2+ and Mg2+ ATPases, as evidenced by an improvement in the electrocardiographic patterns and cardiac injury markers , , , . Moreover, a study from our lab has also demonstrated that naringin (20–80 mg/kg) significantly decreased the infarct size in myocardial ischemia-reperfusion injury in rats through regulation of heat shock proteins 27 and 70, p-Akt/p-eNOS, and MAPKs . In vitro: Naringin (10 mM) has shown a greater inhibition of DPP-IV in comparison to an equivalent concentration of sitagliptin, with higher insulin secretion and glucose disposal along with the protective effects on the pancreatic islets, as reported by Parmar and coworkers . Nevertheless, Purushotham and coworkers have observed that naringin (100 µM) did not suppress hepatic glucose production in Fao hepatoma cells . In vivo: Naringin (0.2 g/kg) has been shown to prevent the progression of hyperglycemia in C57BL/KsJ-db/db mice via an increase in hepatic glycolysis and glycogen concentration, and lowering of hepatic gluconeogenesis . Moreover, in another investigation by the same group and using the same model, it (0.2 g/kg) also led to a reduction in hyperlipidemia and hyperglycemia . More recently, naringin (1 g/kg) has also been shown to mitigate the obesity-related inflammatory state in cats , as well as the metabolic syndrome in C57BL/6 mice (at a dose of 0.2 g/kg) fed a high-fat diet, owing to the AMPK stimulation (similar to metformin), blocking of the MAPK pathways, and by activation of IRS-1 . As an extension of their in vitro study, Parmar and associates have reported a greater inhibitory effect of naringin (40 mg/kg, twice daily) on DPP-IV compared to equivalent doses of sitagliptin in diabetic rats . However, Xulu and coworkers reported an improvement in the atherogenic index but not hyperglycemia in type 1 diabetic rats with the administration of naringin (50 mg/kg) . Apart from an improvement in diabetes per se, another effect, and perhaps, more important, is the potential of naringin to retard as well as improve diabetic complications, as outlined below. Dietary supplementation with naringin (100 mg/kg) improved glucose intolerance, plasma lipid concentrations, and liver mitochondrial dysfunction in rats . Pretreatment with naringin (40 and 80 mg/kg) also dose-dependently ameliorated STZ-induced diabetic neuropathy and partially reversed the pain response . Naringin (10 mg/kg) also effectively reduced lens aldose reductase activity in diabetic rats and therefore could delay the progression of cataracts . Moreover, a study from our lab has also revealed that the upregulation of PPARγ and heat shock proteins 27 and 72 by naringin (25, 50 and 100 mg/kg) attenuates insulin resistance, β-cell dysfunction and associated hepatic steatosis, and kidney damage in a rat model of type 2 diabetes . In vitro: Naringin (2, 5 and 10 µM) has shown dose-dependent protective effects on rotenone-induced cell death in human neuroblastoma SH-SY5Y cells by reducing the activity of caspase-3, caspase-9, and PARP, and inhibiting JNK and p38 phosphorylation . In vivo: The support for the beneficial effect exerted by naringin in studies on Alzheimerʼs disease is substantial. Wang et al. suggested that naringin (50 and 100 mg/kg) substantially alleviated cognitive deficits in an APPswe/PSΔE9 transgenic mouse model of Alzheimerʼs disease through the inhibition of GSK-3β . Naringin (80 mg/kg) also exhibited memory-enhancing activity in unstressed and stressed mice owing to suppression of brain acetylcholinesterase activity and the decrease of nNOS . Apart from Alzheimerʼs disease, naringin (50 and 100 mg/kg) has shown a protective effect against ischemia reperfusion-induced cerebral injury in rats . Naringin (20 and 40 mg/kg) started 1 day after spinal cord injury in rats promoted neuronal recovery by decreasing apoptosis and augmenting BDNF and VEGF expression . Naringin (40 and 80 mg/kg) has also protected rat brains from colchicine-induced and D-galactose-induced cognitive dysfunction , . Another study highlights the therapeutic potential of naringin (50 mg/kg) against 3-nitropropionic acid-induced Huntingtonʼs-like symptoms in rats via modulation of the nitric oxide pathway . It has also been reported that naringin (50 and 100 mg/kg) improves post-stroke depression in mice through nitric oxide modulation . In an elevated plus maze model of anxiety, naringin (30 mg/kg) demonstrated a strong anxiolytic effect . Naringin (50 and 100 mg/kg) has also shown protection against immobilization stress-induced biochemical and behavioral alterations and mitochondrial dysfunction in mice . Naringin (50, 100, and 200 mg/kg) also significantly alleviated antigen-induced chronic fatigue in a mouse model of water immersion stress via decreasing immobility time, hyperalgesia, and TNF-α levels . In vitro: Naringin at a concentration of 1000 µM inhibited PhIP-induced genotoxicity in human liver slices, highlighting a protective effect against naturally occurring genotoxins in food such as PhIP and other cooked food mutagens . Naringin (100 µM) also possesses tremendous potential in protecting rat hepatocytes from environmental toxins such as okadaic acid and microcystin-LR-induced overphosphorylation, disruption of the keratin cytoskeletal network, and apoptotic cell death, though it was ineffective in preventing toxin-induced apoptosis of human or rat hepatoma cells . Likewise, in another study by Berven and colleagues, naringin (100 µM) has exerted protective effects in isolated rat hepatocytes against okadaic acid-induced apoptotic cell death and disruption of the keratin intermediate filament network and canalicular sheaths, though these effects could not be replicated in vivo . In other studies, it significantly prevented the okadaic acid-induced inhibition of hepatocyte autophagy and endocytosis at a dose range of 5–100 µM  and phosphorylation of intracellular proteins in rat hepatocytes such as glycine N-methyltransferase at a dose of 100 µM  and plectin at dose of 100 µM . In vivo: Naringin (0.05–0.125 g/L) alleviated the adverse effects of ethanol ingestion in rats by increasing ethanol and lipid metabolism . At a dose of 100 mg/day, it also inhibited steatosis, necrosis, and fibrosis, as evidenced in a rat model of alcoholic liver disease, probably via the decreased expression of Sirt1/PGC1-α (enzymes involved in regulating energy metabolism in response to calorie restriction) . Breast cancer: Naringin has been shown to inhibit the proliferation of human breast carcinoma MDA-MB-435 cells in vitro as well as DMBA-induced mammary tumor formation in female Sprague-Dawley rats . Molecular docking has also shown naringin to potentially inhibit estrone sulfatase and, hence, attenuate the hormonal stimulation of breast cancer cells . Experiments on ER (+) MCF-7 and MDA-MB-231 breast cancer cells have concluded that naringin (0.86 × 10−5–17.2 × 10−5 M) possesses both estrogenic (at low concentrations) and antiestrogenic (at high concentrations) activities primarily through selectively binding with estrogen receptors alpha and beta (ERα and ERβ) . Schindler and Mentlein demonstrated that naringin (0.1 µmol/L) significantly inhibited the release of VEGF from MDA breast cancer cells and, hence, reduced the occurrence of angiogenesis, which is one of the initiating factors for distant metastases of cancer cells . Colon cancer: Naringin (1–300 µM) has been shown to induce migration of murine immortomouse/Min colon epithelial, Apc± cells through modulation of matrix metalloproteinase activity, thus enhancing the differentiation of these cells and reducing the accumulation of mutations . Similarly, naringin (200 mg/kg) also ameliorated azoxymethane-induced aberrant crypt foci formation in rats by suppressing proliferation and increasing apoptosis of colon epithelial cells . Naringin (100 and 200 mg/kg) accelerated the regression of preneoplastic lesions and the colorectal structural reorganization in a rat model of 1,2-dimethylhydrazine-induced carcinogenesis . Genito-urinary tract cancer: Pretreatment with naringin stimulated death receptor and mitochondria-mediated apoptosis and, hence, reduced survival of human cervical SiHa cancer cells with an IC50 of 750 µM . In human 5637 bladder cancer cells, naringin (0–150 µM) dose-dependently inhibited the cell growth and proliferation by activating the Ras/Raf/-dependent ERK signaling pathway . Lung cancer: In A549 human lung cancer cell lines, naringin (23 µM) suppressed the enhancing effect of beta-carotene on DNA damage induced by NNK, a potent tobacco-related carcinogen in humans . In the same cell line model, naringin (100 µM) also reduced EGF-induced MUC5AC secretion through the inhibition of MAPKs/AP-1 and IKKs/IκB/NF-κB signaling pathways . Liver cancer: Naringin (40 mg/kg) has been shown to offer significant protection in N-nitrosodiethylamine-induced (200 mg/kg) liver carcinogenesis in rats . Cancers of the oral cavity: In a hamster cheek pouch model, naringin (0.20–0.25 mg/kg) significantly reduced the tumor burden in DMBA-induced oral cancer . Skin cancer: In an in vitro study on human keratinocytes and fibroblasts, naringin (100 nM) prevented the formation of double strand DNA breaks following exposure to UV-A radiation, which is considered to be an important etiological factor for skin cancer in humans . Soft tissue tumors: Oral administration of naringin (30–300 mg/kg) inhibited tumor growth in sarcoma S-180-implanted mice . In rats with Walker 256 carcinosarcoma, naringin (25 mg/kg) suppressed tumor growth by approximately 75 % through decreasing IL-6 and TNF-α levels . Interaction with other anticancer agents: In Ehrlich ascites tumor bearing mice, naringin (100 mg/kg) enhanced the tumor cell growth inhibition (cytotoxic effect) of irinotecan (50 mg/kg) as the combination demonstrated a greater suppression of liver cancer cells , . In vitro: In rat osteoblast-like UMR-106 cells, naringin (10 nM to 1 µM) increased cell proliferation and ALP activity . Similarly, in the same cell line model, naringin (0.1–0.001 µmol/L), in a dose-dependent fashion, augmented osteoblastic activity via the inhibition of HMG-CoA reductase . Naringin (0.3–10 µM) has been shown to enhance alkaline phosphatase activity, the osteocalcin level, osteopontin synthesis, and cell proliferation in primary cultured osteoblasts . Naringin has also been shown to improve osteogenic proliferation and differentiation in MC3T3-E1 cells via upregulation of Runx2, COLI, and OCN protein expressions (at a dose of 2 µg/mL)  as well as modulation of BMP-2, alkaline phosphatase, and osteocalcin (at a dose of 0.1–10 µmol/L) . However, the same study by Ding and coworkers failed to show any significant effect on cell calcification . Naringin (1–100 µg/mL) also enhanced the proliferation and osteogenic differentiation of human bone mesenchymal stem cells . In vivo: Naringin has been shown to prevent bone loss following an ovariectomy in C57/BL6J mice when administered at 0.2–0.4 mg/g . Wu and coworkers proposed that naringin (0.1 mg/kg) prevented the decrease of BMP-2 (protein involved in osteoblastic differentiation and bone formation) and, hence, significantly reduced the bone loss in response to ovariectomies in mice . The estrogenic property of naringin at a dose of 100 mg/mL has also been reported to enhance new bone formation in New Zealand white rabbits . It also improved bone quality in orchidectomized rats at a dose of 200 mg/L . This was further confirmed in diabetic mice by Zhou and coworkers who demonstrated that naringin (10 mg/kg) restores the calvarial thickness and bone volume almost towards normal along with an increase in the concentration of osteocalcin . Naringin improved bone mineral density by 10.2 % at the distal metaphyseal area at a dose of 5 g/L  as well as the alveolar bone at a dose range from 0.01 to 100 mg/L  in rats, providing evidence for the attenuation of bone resorption. More recent studies have further shown that in addition to osteoclast differentiation, naringin also abrogates osteoclastogenesis at a dose of 1–100 µg/mL  and bone resorption via the inhibition of RANKL-induced NF-κB and ERK activation at a dose range of 0.1–0.5 mM . In another study, naringin treatment (20–100 mg/kg) significantly normalized the serum alkaline phosphatase and bone weight coefficient, and resulted in a higher femur bone mineral density in a model of retinoic acid-induced osteoporosis in rats . Naringin (15–150 mg/kg) has been shown to inhibit the onset of collagen-induced arthritis in the joints of mice via inhibition of Box-1 protein expression as a consequence of its anti-inflammatory action . In vitro: Naringin (0.1 µM) has been shown to augment the growth of the spheno-occipital synchondrosis via increased Sox9 levels . It (0.01–100 mg/L) also promotes the proliferation of human periodontal ligament cells via modulating alkaline phosphatase activity, collagen protein-1 expression, and osteoprotegerin mRNA levels . It (0.0625–0.25 g/mL) also interferes with the growth of periodontal pathogens such as Actinobacillus actinomycetemcomitans and Porphyromonas gingivalis . In vivo: Dietary supplementation with naringin in experimental animals has shown significant beneficial effects on dental health and development. Dietary naringin (5.7 g/kg) significantly reduced the molar crestal alveolar bone-cemento-enamel junction distance during alveolar development in young male albino rats , as well as the incidence of occlusal dental caries induced by a high-sucrose diet in young rats . Naringin possess tyrosinase inhibitory activity (IC50 of 1.9 mM) and could be useful in skin whitening . It (20 and 50 mg/kg) has also prevented the development of picryl chloride-induced contact dermatitis in mice, a type IV allergic reaction . Though naringin is neither a central nor peripheral antitussive, Gao and colleagues observed an antitussive effect of naringin at 30 mg/kg in guinea pigs due to hitherto unexplored mechanisms . Naringin (1 and 3 mg) resulted in significant protection against Salmonella typhimurium aroA-induced lethal shock in LPS-responder mice via attenuation of TNF-α levels and CD14 and high-mobility group-1 expressions and normalization of prothrombin time, fibrinogen concentration, and platelet numbers . Naringin has been shown to possess antifilarial activity in vitro against Brugia malayi with an IC50 of 78.8 ± 11.5 µg/mL against female adult worms , as well as weak anti-dengue activity with anti-adsorption effects against dengue virus type-2 with an IC50 of 168.2 µg/mL . Furthermore, naringin (20–250 µg/ml) does not inhibit the growth of the normal commensal bacteria in the gut and, hence, does not increase the risk of superinfections . Similarly, Celiz and associates also observed that naringin did not inhibit any bacterial growth at a concentration of 0.25 mmol/L . Lambev and colleagues demonstrated that naringin (200 mg/kg) inhibited mastocystic histamine release induced by compound 48/80 in male albino rats; however, it did not affect the histamine levels in the blood . In another study, naringin (0.1 or 1 mM and 1.0 mg/kg, respectively) significantly inhibited compound 48/80-induced histamine release from rat peritoneal mast cells and IgE-dependent passive cutaneous anaphylaxis reaction in mice via inhibiting IL-6 levels. Moreover, in the same study, naringin (0.1 or 1 mg/kg) also decreased clinical symptoms and proinflammatory cytokines levels in the allergic rhinitis in mice . In another study by Itoh et al., naringin (20–100 mg/kg) dose-dependently inhibited DNFB-induced triphasic cutaneous reaction (ear swelling) at 1 h (immediate phase response), 24 h (late phase response), and 8 days (very late phase response) after DNFB challenge, an animal model for type I allergic reaction . Naringin (200 mg/kg) has significantly reduced the ulcer index and improved gastric mucosal morphology in acetylsalicylic acid-induced ulceration in rats . Moreover, naringin (400 mg/kg) has also been shown to prevent the development of gastric ulcers following ethanol ingestion in rats, presumably by mechanisms not involving prostaglandins . In another model of gastrointestinal motility dysfunction, naringin (50 mg/kg, orally and 5 mg/kg, i. v.) has been shown to exhibit in vivo prokinetic activity via activation of ghrelin receptors . Activation of Kir 3.4 by naringin (100 µM) has been shown to hamper angiotensin-II-stimulated membrane voltage and aldosterone secretion, and therefore could be useful as an experimental tool in the study of aldosterone production from the adrenal glands . In addition, experiments on rat vas deferens have shown that naringin (2 × 10−6–1 × 10−7 M) is a better α 2 agonist than clonidine, thus suggesting its employment as an experimental drug to detect the α-receptor modulation of newly designed or discovered molecules . In a study by Shaik and colleagues, naringin (0–40 µM) was shown to inhibit suicidal erythrocyte death via suppressing the calcium entry and therefore could be of importance in related cell signaling pathways . Thus, the aforementioned data suggests that naringin possesses therapeutic potential in various human disorders. Nevertheless, the employment of naringin in clinical therapy is fraught with numerous shortcomings, as of today. Firstly, the amount of data on the use of naringin in humans is very limited and, as such, the accurate effect of naringin in these human disorders, if any, can merely be predicted. Therefore, further clinical studies are imperative to determine a conclusive role for naringin in human therapeutics. Secondly, naringin is a normal dietary constituent. As such, the regular intake of food would undoubtedly introduce naringin into the human body, but it is unclear whether this administration is sufficient to meet the therapeutic levels in humans, or if additional external supplementation is indispensable. Moreover, the duration of which naringin should be administered is also unclear, as it is unlikely that a short-term intake of naringin would lead to therapeutic improvement. The effect of naringin may only be reached by a continuous uptake. Thirdly, the significant potential of naringin for drug interactions should also receive due consideration when used concomitantly with other allopathic medications. Nevertheless, naringin does seem to represent the light at the end of the tunnel as a supportive remedy for allopathic treatment considering its wide range of purported efficacy and the relatively lesser incidence of adverse reactions. The authors gratefully acknowledge the Department of Science and Technology, Government of India for providing fellowships to Saurabh Bharti (IF10332) and Neha Rani (IF120584) under the INSPIRE-DST-Fellowship program. Due to the limitation of space, we would like to apologize to those whose significant work could not be incorporated in the present review article.